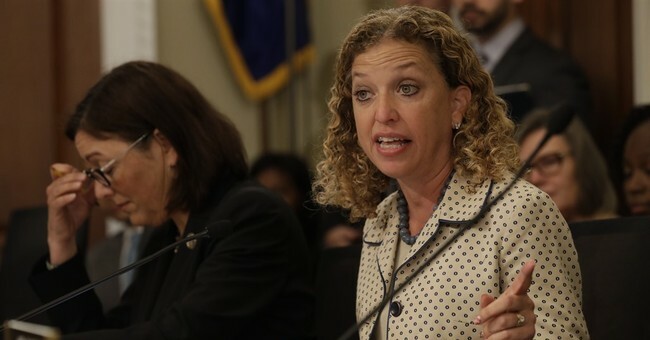 WASHINGTON -- Rep. Debbie Wasserman Schultz, D-Fla., the former Democratic National Committee chairwoman known in political circles as DWS, is knee-deep in a scandal that involves a laptop, money and possible foreign entanglements. Unlike the Trump Russian scandal, however, The Washington Post and New York Times have barely reported on the story, which has conservatives observing -- with President Donald Trump's Twitter account concurring -- that the mainstream media have a double standard. In February, the House sergeant-at-arms yanked House computer network access for five information technology staffers who worked as shared employees for some 30 House Democrats. Capitol Police told members that the five were under criminal investigation for possibly violating security policies -- and asked members to update their security settings. By March, most Democrats had fired the five, if only because they could no longer do their jobs. To the puzzlement of many Democrats and Republicans, Wasserman Schultz kept one of the five, Imran Awan, on the payroll, even though he could not do standard House IT work. On July 24, federal authorities arrested Awan at Dulles Airport as the naturalized citizen was about to board a plane to his native Pakistan. According to an FBI affidavit, Awan had just wired $283,000 to Pakistan, $165,000 of it from an ill-gotten home-equity loan. The feds charged Awan with bank fraud, and then released him under supervision. Only then did Wasserman Schultz fire Awan. Awan's wife, Hina Alvi, who was one of the fired IT workers, had left the country for Pakistan in March. While she had bought a round-trip ticket with a return date in September, FBI Special Agent Brandon C. Merriman wrote he "does not believe that Alvi has any intention to return to the United States." Wasserman Schultz is no obscure member of Congress. Last year she had to resign as DNC chair after WikiLeaks revealed that she had tilted the Democratic primary in favor of Hillary Clinton, even though the national committee was duty-bound to remain neutral. Earlier this month Wasserman Schultz told the South Florida Sun Sentinel that she kept Awan on the payroll because she had "grave concerns about his due process rights being violated," and stated her belief that the Capitol Police actions could be the result of anti-Muslim, anti-Pakistani profiling. She kept Awan on the payroll by switching his role to an advisory position. Awan's attorney Christopher Gowan released a statement that blamed the firings on "a frenzy of anti-Muslim bigotry," charged that "extremist right-wing bloggers" forced Awan's family to leave the country and voiced confidence that Awan "will soon be able to clear his name and get on with his life." It is important to note that federal authorities have not charged any of the IT five -- Awan, Alvi, Awan's two brothers or a friend -- with any crime directly related to their House IT work. But Matthew Whitaker, executive director of the Foundation for Accountability and Civic Trust, sees Awan's continued presence on the payroll as a violation of House ethics rules. "After Awan was barred from accessing the House computer system, Wasserman Schultz continued to pay Awan with taxpayer funds for IT consulting - a position he could not possibly perform," Whitaker wrote to the House Ethics Committee. Awan's salary also is an issue. Politico reported that Awan made nearly $2 million since he started working for House Democrats in 2004. Senate Judiciary Chairman Chuck Grassley wrote that over 13 years, Awan, his brothers and wife "collected more than $4 million," which he said is "three times higher than the norm for a government contractor." There is enough smoke to this story to merit intense news coverage. Yet The Washington Post, the federal government's hometown paper, had published only two stories on the Awan saga as of Tuesday, when the Post ran an explainer that looked at the story through two lenses -- one conservative, one liberal. The "conservative media" angle: "A powerful Democratic congresswoman refused to fire an information technology aide after he's accused of stealing House computer equipment and potentially breaching security protocols." The "liberal media" angle: "Powerful Democratic congresswoman protects Muslim IT staffer from what she suspects is religious discrimination. She fires him after he is charged with a seemingly unrelated crime." For this story, the Post simply could not take a side. Its coverage of the Trump Russia probe shows no such hesitation. Likewise The New York Times began a July 28 story with a warning of sorts -- that "conservative news outlets have built a case against Imran Awan, his wife, two brothers and a friend, piece by piece." Hmm. Could it be that conservative outlets built the case because most liberal organs didn't see much of a story? When Trump has railed against leaks from the intelligence community, cable pundits routinely have slammed the president for not appreciating members of the intelligence community who put their lives on the line every day. When Wasserman Schultz has accused the Capitol Police of racial or religious profiling, newspapers have simply repeated her accusation. The twin papers focused on how the fringe has framed the story -- one "YouTube conspiracy theorist" accused Awan and friends of being "Pakistani spies" -- as if fringe opinion absolves them from having to follow the story where it leads. It is impossible not to see a double standard. The Democrats' IT guys enjoy the presumption of innocence. And that would be OK, if big beltway media showed the president the same courtesy.